1. 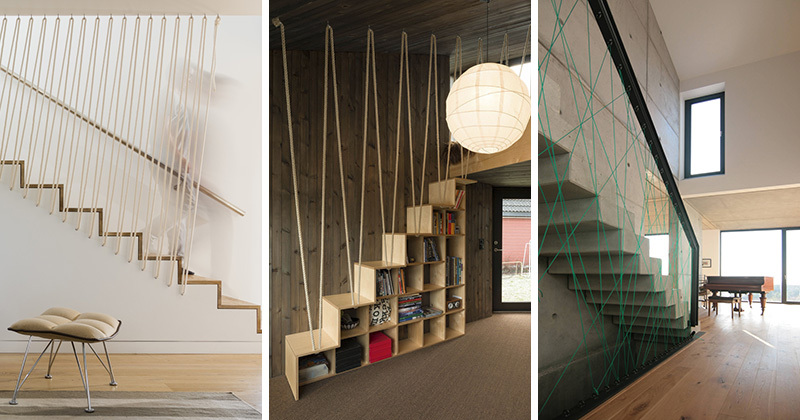 The railing of these stairs and the protective railing along the lofted area are made from thick rope that adds visual intrigue to the space and keeps it safe. Jarmund/Vigsnæs Arkitekter designed this cottage in Oslo, Norway. Photography by Jonas Adolfsen. 2. A rope safety barrier along one side of the stairs and a metal railing on the other side, makes sure that these white and wood stairs are safe and chic at all times. 3. 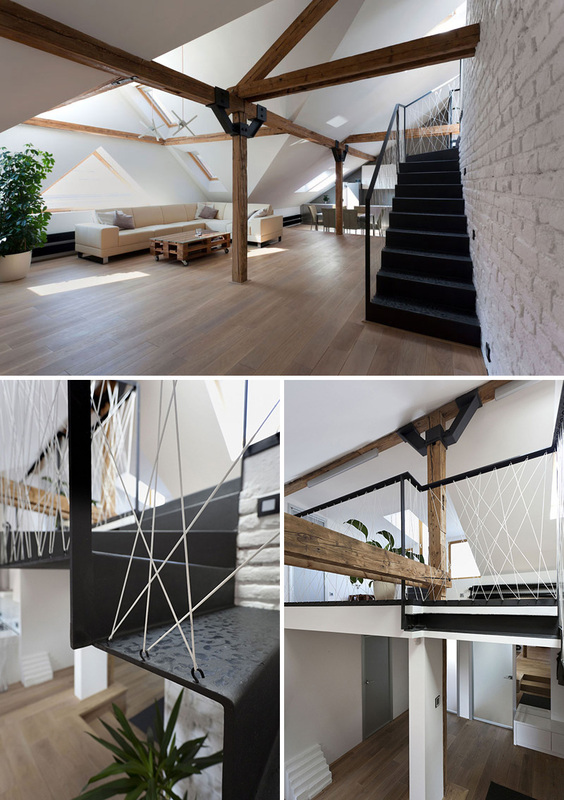 The white rope zig-zagging up the banister of these black steel stairs creates an industrial look consistent with the other industrial elements in the loft. B² Architecture designed this loft in Prague, Czech Republic. Photography by Alex Timpau. 4. The black metal staircase in this hotel is made more playful and safer thanks to the turquoise elastic rope woven throughout the banisters. Roman Vrtiška and Vladimír Žák designed the Moods Boutique Hotel in Prague, Czech Republic. Photography by Filip Šlapal. 5. Colorful rope, black steel railings, and concrete angular stairs give this staircase a contemporary look and make sure that those going up and down are always safe. mo+ architekten designed this home in Frankfurt, Germany. Photography by Heiko Messerschmidt. 6. 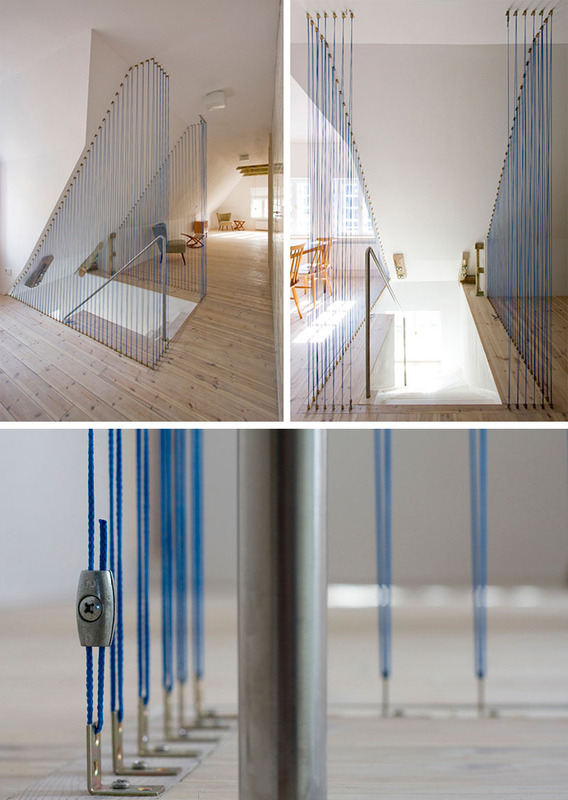 At the top of these stairs in this modern home, blue thin ropes have been added to create a safety barrier and a delicate design feature. Karin Matz Arkitekt renovated this home in Germany.